Kodak Brownie 16 circa 1946 purchased with four other versions of the Kodak Brownie. $50 for the set at a yard sale. It’s 2012, the time of technology. Canon and Nikon are releasing updated digital models left and right. Once you have enough money to buy the latest version it’s well, already outdated. So, in this age of technology, where can you find a camera pre-dating your parents? The answer is right around the corner, really. Old cameras can be found in antique stores, flea markets, estate sales, eBay, and a plethora of online stores and ma&pa camera shops. Now most of these places don’t just scream “HEY, WE HAVE OLD CAMERAS HERE!”, it takes a bit of treasure hunting to find them. If you do see a store that advertises selling them, they’re probably extremely over-priced, so we shall go the treasure hunting route. 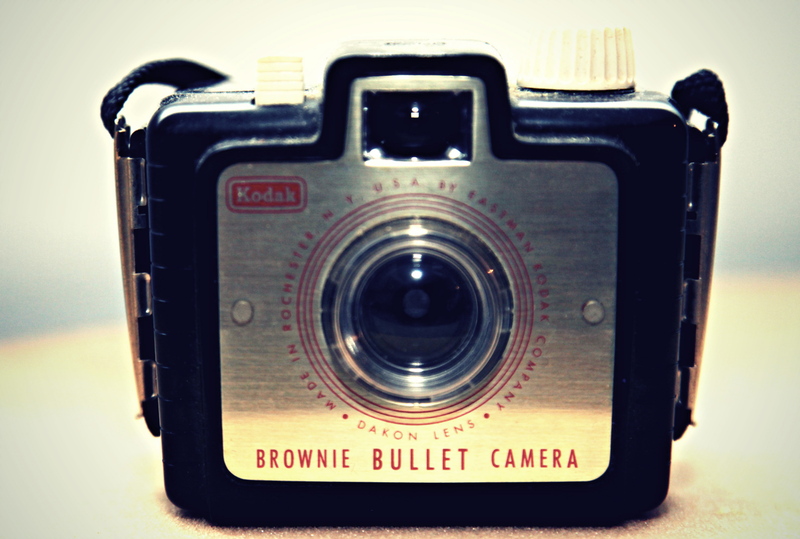 Kodak Brownie Bullet circa 1964 purchased for $10 at a yard sale. model is no longer in existence. It has definitely happened to me and the fate of the camera was to be a neat piece of decor on my bookshelf….not what I intended for $100. In the age of smartphones, we almost all have the ability to google search a brand to instantly find out the value and manual on a certain camera find before we buy it. Yard Sales – Hit or miss, usually miss, but you may find something great here. People who are untrained in the area of antique cameras usually sell them at a very low price at yard sales. Especially if they think that they don’t work. Here you can even find several cameras and buy them all together for a low price. Don’t expect to find any great working condition cameras here, only buy if they can be repaired. Kodak Duoflex circa 1947 purchased for $28 including original flash and manual at an Amish flea market. eBay – Some people know the value of what they have and others don’t. You can find amazing cameras here. The only downside of this is you won’t ever actually know if they work until you have already received it and paid for it. A lot of single sellers (meaning they are just selling one camera) typically don’t know how it works or if it even works so they sell it as is. If you can fix it, great! If not then it’ll look great as part of your decor….but really, who wants to pay and wait in suspense to see if something works? 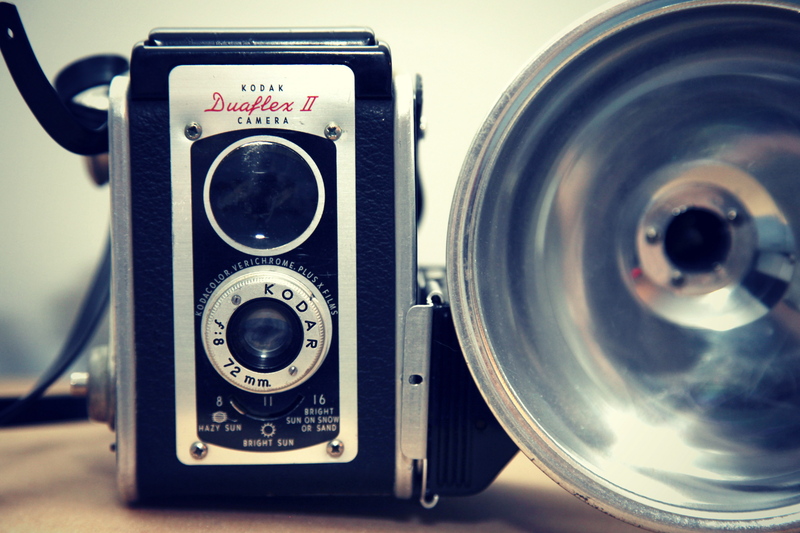 eBay offers other sellers who specialize in selling antique cameras. The only downside to this is that the value and condition of these cameras are investigated, usually by a professional, and the price tag will reflect it. eBay is unique in the way that it lets you search for cameras all over the world, not just within your geographical location. Estate Sales – Typically full of ugly lamps and moldy couches, estate sales sometimes offer some very rare gems if you take the time to look. 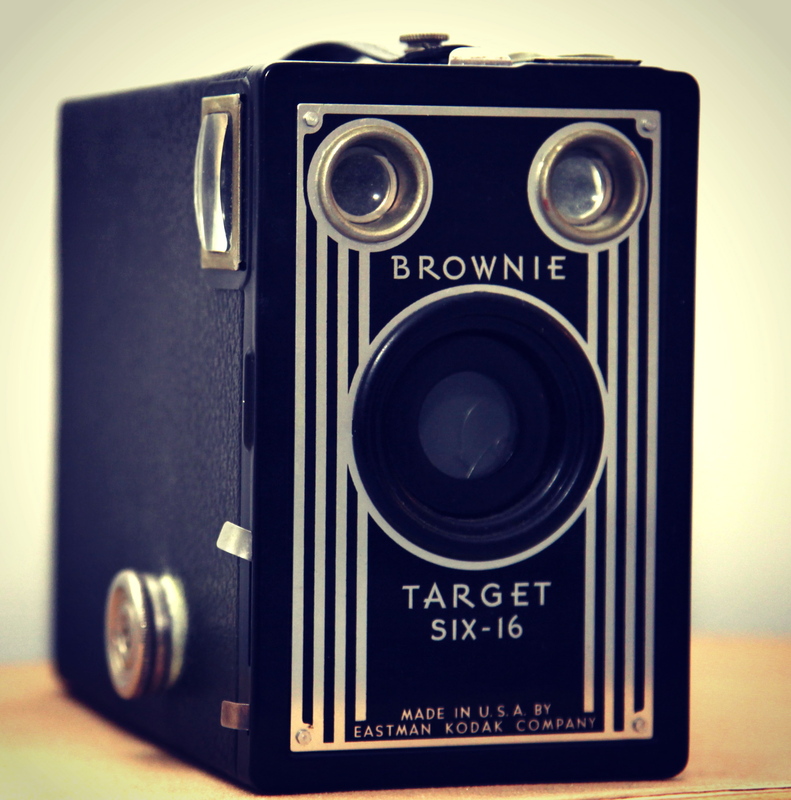 Some of the rarest, most valued antique cameras look like toys to the untrained eye. Throwing grandma’s old Leica in the estate sale for $5 has happened before and it could very well happen to you if you take the time to look in places without judgement. No matter where you go, DO YOUR RESEARCH. Knowing what gives an antique camera it’s value, what condition serves as good condition and how to make sure it works. You don’t want to leave something behind as trash only to find out later down the line it’s worth more than the macbook I’m typing this on. ← Why Use Film in a Digital Age?